The ruling Al-Saud family in Saudi Arabia has been the focus of the Western press in recent days, with many English-language outlets in particular being flooded with op-eds and other pieces about the world’s richest and largest royal family. Even in the absence of evidence that Saudi Crown Prince Mohamed bin Salman knew about the death of Saudi journalist Jamal Khashoggi in the Saudi consulate in Istanbul in Turkey, attacks on him in the Western press have continued, along with speculation about his future as crown prince of the largest producing country in the oil cartel OPEC. The attacks on the 33-year-old crown prince commenced a few days after Khashoggi’s disappearance in the form of press articles coinciding with a number of Saudi princes forging closer ties with Saudi Prince Ahmed bin Abdel-Aziz, 73, the brother of Saudi King Salman. The articles quoted statements by Ahmed bin Abdel-Aziz blaming developments in the kingdom on the present crown prince, though these were later denied. A resident of London, Ahmed bin Abdel-Aziz joined protesters against the war Saudi Arabia is undertaking in Yemen in early September. “Why do you criticise the entire Al-Saud family, when the responsibility falls on a select few,” he was reported to have asked. He held the interior portfolio for five months in 2012 during the reign of late king Abdullah of Saudi Arabia. This was later passed on to his nephew Mohamed bin Nayef, an expert on counter-terrorism who was proclaimed crown prince to King Salman before being replaced by Mohamed bin Salman. Ahmed bin Abdel-Aziz is one of the “Sudairi Seven,” sons of the founding king of Saudi Arabia Abdel-Aziz bin Saud and his wife Hessa Al-Sudairi. The “Sudairi Seven” have been influential in the royal family of Saudi Arabia since the 1960s owing to their control over the ministries of defence and the interior, and they have provided governors of the capital Riyadh as well as a number of smaller positions. Other members include the late Saudi king Fahd and his brothers Sultan and Nayef, crown princes who died before ascending to the throne, in addition to King Salman and the princes Ahmed, Turki and Abdel-Rahman. Anonymous statements in the Western press have cited “the wish of heavy-weight Saudi princes” to see Ahmed bin Abdel-Aziz take over as the Kingdom’s crown prince, replacing Mohamed bin Sultan and former crown prince Moqren bin Abdel-Aziz. This promotion of the name of Ahmed bin Abdel-Aziz seems likely to ignite another round of conflict within the royal household. Saudi Arabia’s large royal family is led by the sons of founding King Abdel-Aziz, who bore 36 sons, each of whom had many sons and grandsons. These number in the hundreds, each bearing the title “His Royal Highness” and having some right to the throne. There are also other princes, nephews of Abdel-Aziz, who have the title “His Highness”. Members of the Saudi Royal Family outside these two circles are called simply princes and number in the thousands. The reports cited in the Western press also talked of the emir of Mecca Khaled Al-Faisal, 78, and Khaled bin Salman, Saudi Arabia’s ambassador to Washington and brother of the current crown prince, who returned to Riyadh after Khashoggi’s death, as possible candidates for promotion. The US newspaper the New York Times explained that Khaled Al-Faisal had been ordered by King Salman to fly to Turkey to meet Turkish President Recep Tayyip Erdogan to discuss the Khashoggi crisis, adding that this indicated his senior position. The UK Daily Telegraph, however, excluded Khaled Al-Faisal being promoted to the position of crown prince after King Salman decided to form a committee headed by Mohamed bin Salman to restructure the country’s security and intelligence apparatuses. Telegraph writer Robert Lacey added that Khaled bin Salman could be a potential nominee to replace Mohamed bin Salman, as he had made a good impression as the Kingdom’s ambassador in Washington. The fact that King Salman had summoned Khaled Al-Faisal from Washington for deliberations could be indicative of changes in the near future, Lacey said. 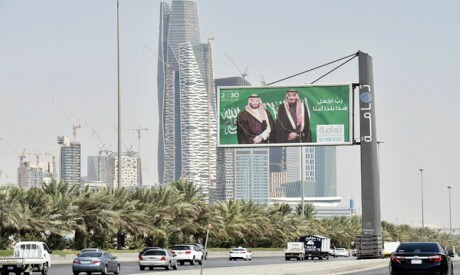 However, there have been no solid indications that change is indeed afoot in Saudi Arabia, despite the media speculation and the strong attacks that have been made on Saudi Arabia since Khashoggi’s death in Istanbul. Saudi Arabia is still of enormous world importance as a trusted oil exporter and the holder of 18 per cent of the world’s reserves of black gold. Any attempt at destabilising the Saudi Kingdom could result in a further increase in oil prices, now standing at $80 per barrel. Saudi Arabia is also the biggest international buyer of weapons, with a defence budget that is the third largest in the world for military spending. It has already signed a deal to buy US weaponry worth $110 billion, and the figure may rise to $360 billion within the next 10 years. Riyadh has also played a role in ensuring world stability through fighting terrorism and extremist ideology over the past few years. Saudi Arabia has helped British people walk the streets of their country safely, according to UK Prime Minister Theresa May. The Saudi Kingdom is also integral to the fight against Iran and its expanding influence in the Middle East. This is a crucial point for the West, which fears the Islamic Republic’s strong presence in Iraq, Syria, Lebanon and more recently in Yemen. It is no secret that economic cooperation with Saudi Arabia is important to a large number of countries. The Saudi Kingdom is a vast country with a relatively large population, and it has powerful economic and financial capabilities. These factors will help protect Riyadh from foreign meddling, ensuring that any changes in the Kingdom’s chain of command will remain in the hands of the ruling circle.